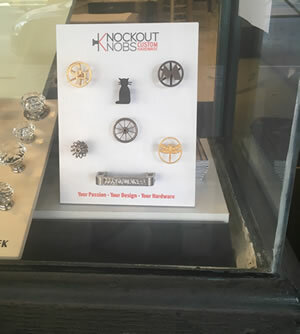 While searching for cabinet hardware, Alice, saw a Knockout Knobs display at Luxcucina, a kitchen design store, on the Upper West Side in Manhattan. 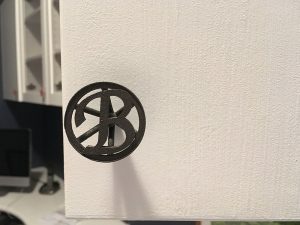 She liked the Monogram Knobs on the Board and wanted to design a B knob for her cabinet. 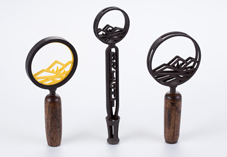 She was happy and surprised to learn she would be able to get one custom knob. Steven, the owner of Luxcucina, contacted Nancy at Knockout Knobs. A few days later we sent the B rendering to Luxcucina. 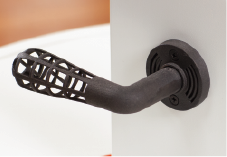 Alice approved the rendering and requested we print the knob in Black Steel to complement her home decor. 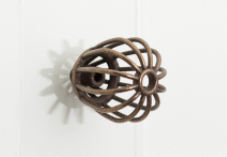 The staff at Luxcucina loved the new knob and delivered it to Alice, a very happy customer.